Spaced Out- VJLoops.com V.A. Promo Mix 2016 from VJLoops.com on Vimeo. Glow Glow Dancers by Dubassy- www.vjloops.com from VJLoops.com on Vimeo. VJ survival kit 3 is now available at www.vjloops.com. Created by LAAK. 100 HD vj clips, perfect for any VJ who wants to have that extra edge in providing a spectacular show. All the same color and hue so you can adjust and tweak the colors yourself for a matching result with the lighting. 3D animation, 2D, splash motion, liquid, circles, squares, dots, lines, particles,.. a very wide range of basic visuals that gives your loop collection that more variety. VJ survival kit 2 showcase by Laak featuring 100 HD loops all minimal style in Black and white (blueish glow) so you can crank the Hue to change color or just colorize it all together. You can layer the visuals or use them as stand alone they fit perfect to any genre or BPM rhythm. On December 9th 2014 I was contacted by a local promoter who wanted to hire a VJ for a Christmas Eve event in Valencia, Spain where I currently reside. One of the biggest challenges I faced was getting the information from the client. They have grand ideas but sometimes are unable to communicate them effectively. After several conversations on the phone and in person meetings totaling about 8 hours of our time we were able to finally get a rough script and storyboard for the intro. The next task was to start collecting the assets for the project which included photos/videos of the DJ along with relevant sponsors logos for the event. Anytime we step into a big project like this we always turn to what assets we have on hand or what we can buy to help expedite the creation process. Stock footage, media and templates are a life saver and if you find the right resources you can save so much time. Especially with tight deadlines. Over the next 10 days we spent so many hours preparing the video which was based on what the client wanted. We knew right away in our opinion that what the client wanted lacked a bit of cohesiveness. None the less we followed through and tried to guide them as we went along. We knew we would be sending a second and third draft as the project progressed. In my experience nothing is every perfect on the first delivery. On the 23rd of December we were able to get into the venue to do a dry run with the DJ, promoter and ourselves to test the equipment and to see how it looked on LED screens that were installed. By the way I should probably mention that during our initial conversations back on the 9th of December I explicitly asked about the dimensions of the screen and resolution. The client told us it would be 16:9 setup. As you can imagine the frustration of not knowing what resolution to create the custom intro in was a bit of a pain. We decided to create at 1280 x 720 (16:9). Knowing that we can always trim or crop parts of the video but not add more. 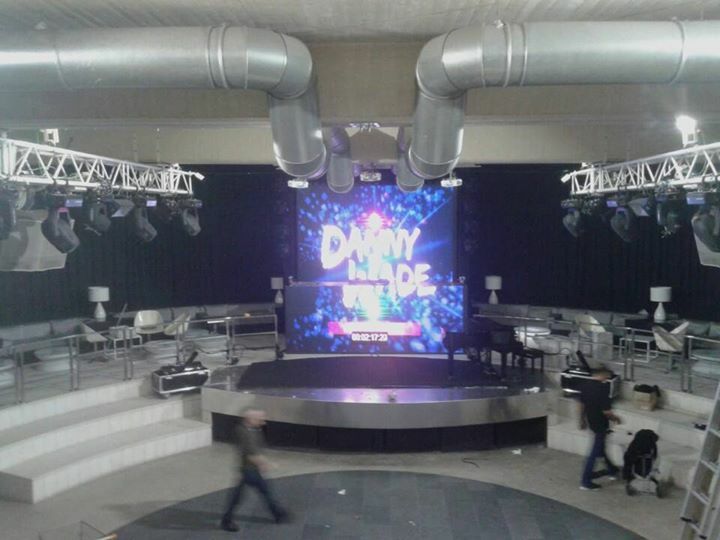 After arriving at the venue we see that the screen is now 1:1 with a total resolution of 384 x 384 pixels. This is why it’s always important to do a dry run but even more so to know what your project settings will be well in advanced. Welcome to the nightlife, where each day brings a new surprise! After receiving the new dimensions we knew we had some major adjustments to the project which required heading back into After Effects to move text into the safe areas as well as moving some of the text footage around. I know that some readers might say that you need to have all the information well in advanced before the event begins but from my experience clients change their mind for a number of reasons. Budget, resources, suppliers, venue, legal reasons and countless other factors all come into play when the final setup is approved and installed. Even then I’ve seen installations go up, come down and go back up as something else within a day because of (insert whatever reason here). With small and medium sized events these things happen often. Sometimes all the planning in the world doesn’t matter. The only thing you can do is to be prepared and expect the unexpected. I find trying to predict what will go wrong usually saves me in the end. Albeit it’s a headache and a time waster it is what it is. You have to be able to adapt and overcome the challenges to survive in this business. With less than 24 hours to show time my animator was busy preparing the intro with all the requested changes as well as text adjustments for the DJ while I continued to prepare the “VJ Loops” for my set. My current VJ software for mixing live is Resolume Arena 4.1. It’s flexible, has nice effects and doesn’t crash. I also use a M-Audio KeyRig 25 as my midi controller. It’s inexpensive, small, lightweight and fits well with my laptop setup. 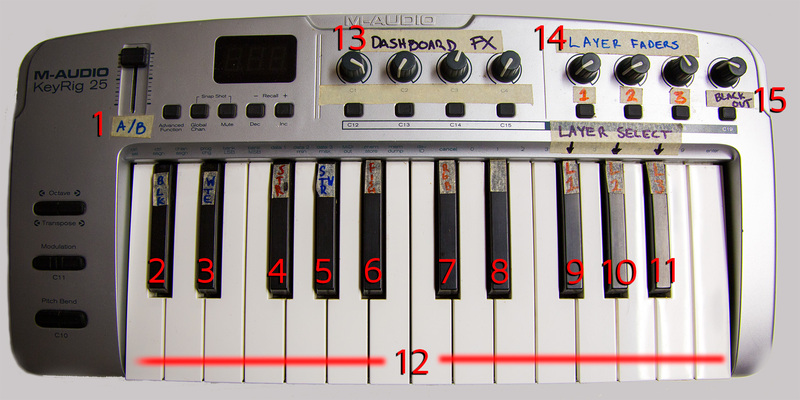 Mapping the keys is quite simple with any popular VJ software. I highly recommend anyone who does live mixing incorporate some kind of controller. I still use a mouse while VJing but enjoy the freedom a controller ads which allows for more creative mixing styles to be applied quickly and effectively. *Pro Tip: adding sound analysis allows your onboard microphone of your laptop or computer to detect the various changes in the music. In Resolume you can do this and much more. The event was scheduled to start at 12:30am which is quite early for the locals (These Spaniards love to party!). People didn’t start arriving until 1am! The headliner DJ wasn’t scheduled until 3am so while the warm up djs performed I painted the screens with logos and very basic sound reactive EQ effect provided by a plugin from BigFug. Promoters, club owners and DJs love to have their branding during the night. It’s always good to make the client happy. As 3am approached I became quite anxious. I was ready to give the crowd a real visual treat with everything we had prepared over the last 2 weeks. The intro included a piano track which was accompanied by a pianist on stage who would do a playback performance. Show business is all about putting on a show and I think we did a pretty good job. Despite the tight deadlines the show was a complete success and the promoter, DJ and club owner were very satisfied with the work. The energy from the crowd was proof. Here is the original intro prepared for the evening. 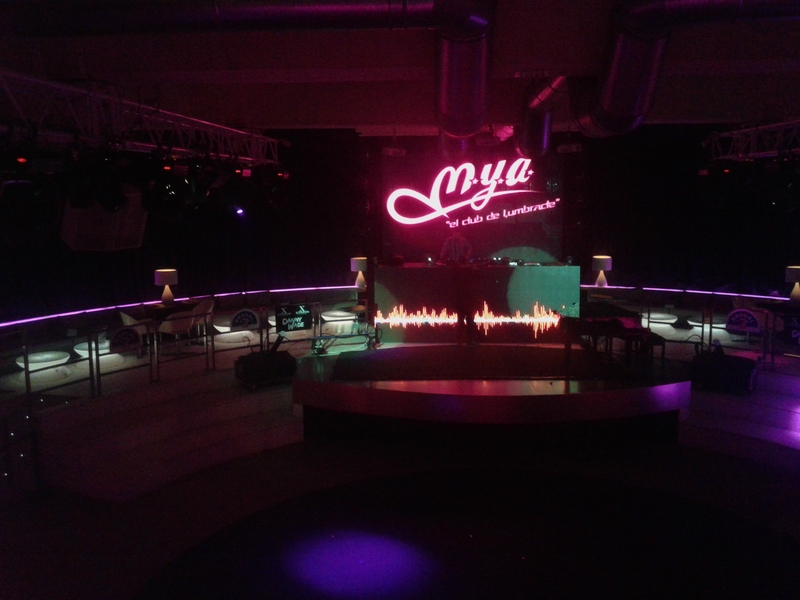 DJ Danny Wade Intro for Christmas Eve at Club Mya 24-25 December 2014 from VJLoops.tv on Vimeo. And some live footage shot by clubbers, the audio was replaced due to poor quality. I tried to sync it up as best as possible.